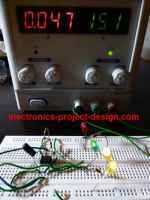 This LED thermometer project uses a standard precision LM34 temperature sensor that has a linear voltage output based on the room temperature in Fahrenheit. If you want to display the temperature in Celcius, you can use the LM35 temperature sensor. There are 3 packages available i.e. TO-92 plastic package, TO-46 metal can package or SO-8 molded package. You can use TO-92 package as it is commonly available in the market. The advantage of LM34 over a thermistor is that the output voltage is linear whereas the thermistor has resistance characteristics that is non-linear. It is also more accurate compared to a thermistor. The only setback is that it is more costly compared to a thermistor. By calibrating the room temperature to coincide with the output voltage of U1, an accurate room temperature can be displayed on ten light emitting diodes. 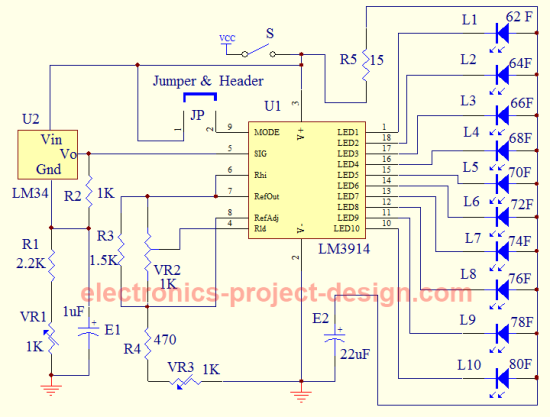 The LED driver to display the temperature is provided by LM3914. A temperature range of 62 to 80 Fahrenheit will be displayed using the bar mode display setting. In this mode, the jumper JP and its header will need to be installed. You can use different LED colors to display the room temperature. For instance L1, L2, L3 and L4 can be green. L5, L6, L7 can be orange and L8, L9, L10 red. This will help to differentiate the temperature of the room from afar. The supply voltage used in this project is 9V DC which is easily available from a typical 9V dry cell battery. A standard LM34 will provide an output of 10mV/deg Fahrenheit. By using a few resistors, the voltage output can be increased to 40mV/deg Fahrenheit hence giving a wider range of voltage. Power up the circuit by connecting to 9V battery and switching on switch S. Calibrate the LM3914 by using a digital multimeter. Adjust VR3 until pin 6 of LM3914 has a value of 3.385V. After this, do the same for pin 4 until it has a value of 2.505V by adjusting VR2. Next, place a thermometer near to LM34 in a room that has a temperature range of 62-80 Fahrenheit but not touching it. Adjust VR1 until the correct LEDs light up based on the room temperature measured. Vin = 0.225 + (0.04 X T) where T is the room temperature in Fahrenheit. Use this formula to check the voltage and the temperature measured. More information on LM34 here.